These Coconut Raspberry Scones are perfect for your next tea party! 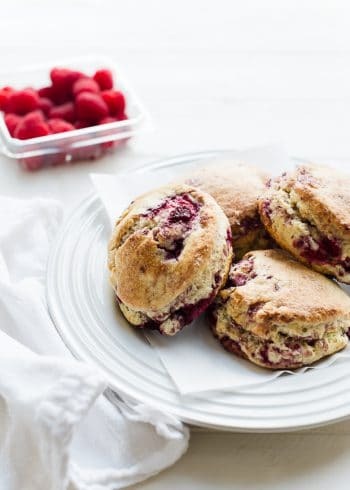 Made with coconut cream, these scones are tender and moist, and bursting with raspberries. Get the recipe today and be prepared for your next tea party or brunch. In a large bowl, whisk together the flour, sugar, baking powder and salt. Using a pastry cutter, cut the butter into the flour mixture, until you have course crumbs. This can also be done with two knives or a food processor. Whisk the eggs lightly and combine with the coconut cream. Add to the flour mixture and stir until just moist. Add the raspberries and coconut to the dough, then mix lightly. The dough will be sticky. On a well floured surface, turn the sticky dough out and knead very lightly until the raspberries are incorporated into the dough and the dough is shaped into a disk. Be as gentle as possible, especially if using fresh raspberries, to prevent the berries from squishing too much into the dough. If the dough feels too sticky, lightly add more flour as you shape the dough. Roll the dough 3/4 inch thick. Using a floured biscuit cutter or cookie cutter, cut out 3-inch rounds. You should have about 8 scones. Place the scones on a baking sheet lined with parchment or a silicone mat, and lightly brush with coconut cream. Stir together the sugar and cinnamon and sprinkle over the scones. Place the scones in the freezer for 30 minutes. Meanwhile, preheat the oven to 400 degrees F.
Once the scones are chilled, bake for 20 minutes, or until golden. Enjoy while warm. Note on coconut cream: Coconut cream is produced in a similar fashion to coconut milk, that is, by cooking a combination of shredded coconut with coconut water. However, coconut cream has less water and is thicker in consistency. You can find coconut cream at Trader Joe’s, Whole Foods, or at your local grocery in the Asian food aisle. This is not to be confused with cream of coconut, which is coconut cream that has been sweetened, and is used in things like pina coladas. See also this article for more on the difference between coconut milk, cream & cream of coconut. Note on raspberries: Whether you use fresh or frozen raspberries, take care in adding them to the dough – use a light hand to prevent the berries from breaking down too much. Frozen works well to avoid this; I would keep them frozen until absolutely ready to add to the dough so they don’t melt and get mushy. Make ahead tips: You can make the scones in advance, and after the initial freezing, place in a freezer bag to store until you are ready to bake. When you are ready to bake, place the frozen scones on your lined baking sheet; there is no need to defrost, but you may have to bake an extra minute or two. Adapted from Cheddar-Dill Scones, The Barefoot Contessa Cookbook by Ina Garten. Freezing dough for ultimate rise acquired from King Arthur Flour.